You've added a couple of hundred keywords to your domain, all set up to track Google search on Desktop. Now you also want to add those keywords for Google mobile searches or Bing. Mark the keywords you wish to duplicate, go to keywords settings and select "Duplicate". Check the desired options. In this case we want to track the keyword on Google mobile as well, so we check Google and Mobile. Click Duplicate. 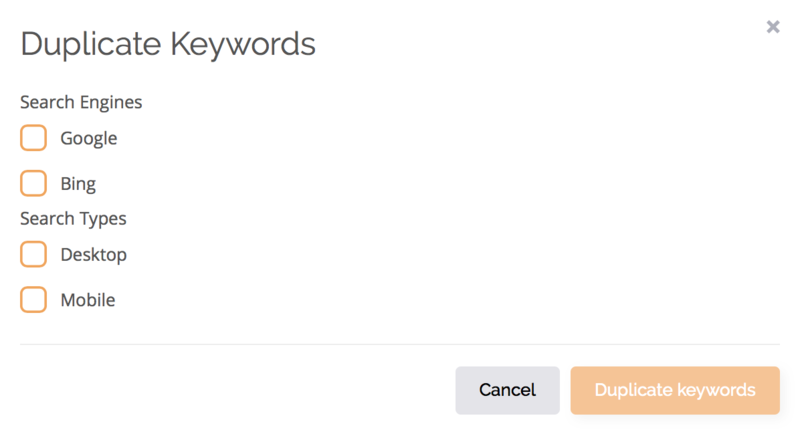 To keep your duplicated keywords organised, click here to read our guide on filtering.